For the saint, see Osgyth. 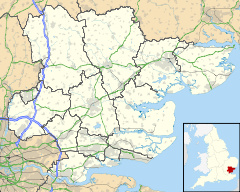 St Osyth is an English village and civil parish in the Tendring District of north-east Essex, about 5 miles (8.0 km) west of Clacton-on-Sea and about 12 miles (19.3 km) south-east of Colchester. It is located on the B1027 road and is named after Osgyth, a 7th-century saint and princess. The name is locally pronounced "Toosey". St Osyth is claimed to be the driest recorded place in the United Kingdom. Before being renamed to commemorate St Osyth, the village was called Chich (also spelt Chiche or Chick), from an Old English word meaning "bend", in reference to St Osyth Creek. Later, the manor of Chich (now St Osyth) in Essex was assumed as part of his royal demesne by the Danish King Canute, who granted it to Earl Godwin, and by him it was given to Christ Church, Canterbury. At the Conquest it was transferred to the Bishopric of London. Thomas Darcy, the first Baron Darcy of Chiche was buried in St Osyth. St Osyth was the subject of an episode of Channel 4's Time Team programme, "Lost Centuries of St Osyth", (series 12 episode 9, first broadcast in February 2005). The programme sought to uncover the early origins of the village, which was presumed to have grown up about the same time as the Priory, in the 12th century. Many of the investigations around the current village centre found little evidence of settlement earlier than the 14th century; it appeared that the early village centre lay some way off, between the Priory and the river. The village was a focus for the St Osyth witch persecutions in the 16th and 17th centuries. A total of ten local women were hanged as a result. In 1921 the skeletons of two women were discovered in the garden of a house in the village. One was claimed to be the witch Ursley Kempe, who was the first to be prosecuted. The skeletons became a local tourist attraction. A young Osyth drowned in a stream, but was revived by nuns from the local convent praying for her for three days. Osyth was executed by beheading; where she fell a spring issued forth from the ground. She picked up her head and walked to the door of the nunnery, where she knocked three times on the door before collapsing. Osyth's ghost is said to walk along the priory walls carrying her head one night each year. In the Napoleonic Wars two Martello Towers were built on the peninsula between the Colne Estuary and Brightlingsea Creek. One survives at Stone Point and is now the East Essex Aviation Museum. The peninsula was cordoned off and used by the Navy and Army in both world wars. Between 1942 and 1944 it was a large, minor landing-craft training base called HMS Helder. No 1 Martello Tower was a signal station and minefield control point, linked to the Navy at Brightlingsea. St Osyth is claimed to be the driest recorded place in the United Kingdom, with an average rainfall of just 507 mm (20 inches) per year. St Osyth parish extends south from the village to the coast, and includes the smaller villages Point Clear and Lee-over-Sands. Although a significant part of the parish boundary is coastline, which does not need to be "beaten", St Osyth is one parish which maintains the tradition of beating the bounds on Rogation days. The most notable building in the village is undoubtedly St Osyth's Priory, a group of Grade I listed buildings. The Abbey was the home to the Earls of Rochford, following King William III's creation of the title for William Nassau de Zuylestein in 1695. At St Osyth Priory, where an outbreak occurred last week, there was one of the few remaining herds of White Park cattle, one of the oldest breeds in this country. That has now been slaughtered, together with the small dairy herd and the stock of pigs. The farm is attached to the convalescent home maintained at the Priory by the Shepherds Friendly Society. The land within the Priory boundaries is shown as a Deer Park on the Ordnance Survey map. The village church is dedicated to Saints Peter and Paul. The Martello tower at Point Clear has been converted into a war museum. Another landmark is Mill Dam Lake, which is filled and emptied from St Osyth Creek. It is used for water skiing. St Osyth Beach and adjoining Jaywick were the scene of fatalities during "The Great Flood" of 1953. The Venue is an entertainment venue that opened in St Osyth in early 2009. In its opening year it played host to the Sugababes, N-Dubz, The Drifters, Ricky Tomlinson, Kevin Bloody Wilson and The Stylistics. The St Osyth Social Club in Church Square is home to league darts teams, St Osyth Social, The Priorymen and SOSC Ladies. Ursula Kemp (c. 1525–1582), midwife, was tried and hanged for witchcraft. Somerset de Chair (1911–1995), author and politician, owned St Osyth's Priory from 1954 until his death. ^ "Ward/Civil Parish population 2011". Retrieved 25 September 2015. ^ Hanks, Patrick; Hodges, Flavia; Mills, David; Room, Adrian (2002). The Oxford Names Companion. Oxford: the University Press. p. 1179. ISBN 0198605617. ^ Rowlands, Alison. "BONES OF CONTENTION". Centre for Local and Regional History. University of Essex. Retrieved 6 May 2009. ^ National Archives: Brightlingsea Naval Base Records, 1914–18, 2nd World War Admiralty Green Lists and ADM 199 series files; veterans' interviews and correspondence with RNVR Lts Usher, Ruegg, Nixon etc. collected by J P Foynes, author of Battle of the East Coast 1939–1945 and Under the White Ensign. ^ "Earls Hall Farm windfarm (United-Kingdom)". The Wind Power. October 2013. Retrieved 13 October 2013. ^ Dwan, James (4 January 2007). "St Osyth: Village is driest place in the UK". Colchester: Daily Gazette. Retrieved 30 June 2013. ^ a b Historic England. "St Osyth's Priory, Gatehouse and east and west flanking ranges (Grade I) (1111495)". National Heritage List for England. Retrieved 16 June 2014. ^ Historic England. "St Osyth's Priory the Darcy Tower also known as Abbot's Tower and vaulting to west (Grade I) (1146545)". National Heritage List for England. Retrieved 16 June 2014. ^ Historic England. "St Osyth's Priory the Chapel of St Osyth and ruins attached to north (Grade I) (1166377)". National Heritage List for England. Retrieved 16 June 2014. ^ Historic England. "St Osyth's Priory: The Abbot's Lodging and South Wing, the Darcy Clock Tower and C18 House (formerly listed as the Convalescent Home) (Grade I) (1337158)". National Heritage List for England. Retrieved 16 June 2014. ^ Historic England. "St Osyth's Priory ruined east ranges of the Darcy House including the Tower and Chapel (Grade I) (1337159)". National Heritage List for England. Retrieved 16 June 2014. ^ Joyce, Terry (2008). "TM1216: Deer Park, St Osyth". Geograph Britain and Ireland. Retrieved 2016-05-30. ^ Historic England. "Church of St Peter and St Paul (Grade I) (1111513)". National Heritage List for England. Retrieved 16 June 2014. ^ Historic England. "Martello Tower (Grade II) (1309070)". National Heritage List for England. Retrieved 16 June 2014. ^ Rutherford, Tristan (15 June 2015). "Britain's best nudist or naturist beaches". Telegraph.co.uk. Retrieved 16 August 2015. ^ "St Osyth Naturist Beach". naturistdirectory.com. Retrieved 2016-05-30. ^ Dwan, James (9 May 2007). "St Osyth: Which witch is which?". Echo. Retrieved 16 February 2019. ^ Waugh, Michael Anthony (23 September 2004). "Golding, Benjamin (1793–1863), physician". Oxford Dictionary of National Biography. doi:10.1093/ref:odnb/10909. Retrieved 16 February 2019. Wikimedia Commons has media related to St Osyth. This page was last edited on 17 February 2019, at 13:01 (UTC).